Deep garnet red with violet tinges. Clear and bright. Intense, clean and balanced nose. Expressively open and suggestive. Hints of vine leaf and seasonal fruit (blackcurrant and cherry), with a certain smokiness and a definite carbide metallic character. Its wide range of aromas give it a strong personality. Hints of moorland herbs (rosemary and lavender) which accentuate its Mediterranean feel. Frank and direct attack on the palate, then delicately fruity and round. 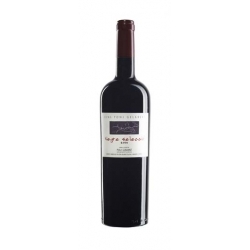 The faint hint of tannin enlivens the velvety, silky flavour created by the quality of this polished tannin. Very long, lingering aftertaste, extravagant and lasting.